[toc]Abscesses are pus filled skin eruptions in any part of the body, which are generally formed due to infection by bacteria or entry of some foreign substance into the skin such as a splinter. Pain, inflammation and swelling are some of the key features of an abscess. Herbal remedies for abscesses include Garlic, Barberry, Goldenseal, Neem, Aloe Vera, Echinacea, Milk Thistle, Red Clover, Chamomile, Tea Tree and Calendula. Some of these herbal remedies are very effective in fighting the bacterial infection causing the abscess. Others are good for ensuring skin repair and healing the skin. 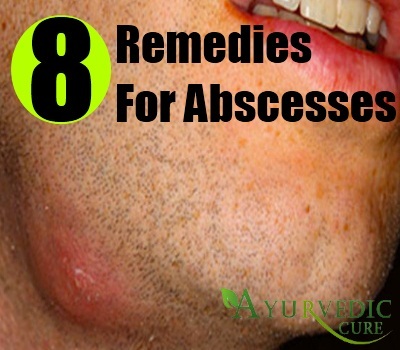 In this article, we will discuss some of the top herbal remedies for curing abscesses. Please ensure that you consult a skin doctor before using any of these herbal remedies. Large abscesses require critical medical care. Neem is also known as Indian Lilac. The botanical name of this herb is Azadirachta Indica. Neem is well known in Ayurveda as a cure for many diseases. This remarkable herb is an antiviral and antibacterial. Due to this reason, it is very effective in healing abscesses. 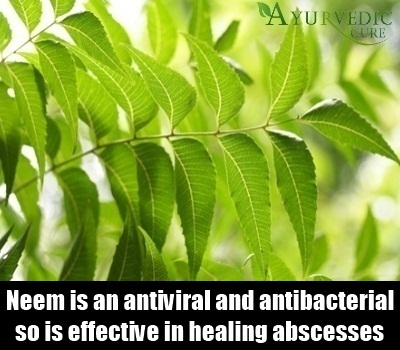 Neem destroys the harmful bacteria which cause abscesses to form. You can take Neem tablets to cure this skin condition. You can also apply diluted Neem oil on the abscess for relief from the infection. Dilute the Neem oil by mixing it with Olive oil and dab it onto a cotton ball. Place this ball directly over the abscess. Apply this herbal remedy regularly to see improvements in your condition. Aloe Vera is an antifungal, antiviral, antimicrobial and antiparasitic herb. As this herb is also antibacterial, anti-inflammatory and a natural antiseptic, it is a useful herbal cure for abscesses. Aloe Vera soothes the skin and heals the abscess. If the abscess has formed due to a bacterial infection, this herb starts the healing process by destroying the harmful bacteria. Glycoproteins and polysaccharides in this herb bring down the swelling and ease the pain. These active ingredients also initiate skin repair mechanisms which help to restore your skin to its normal, healthy state. 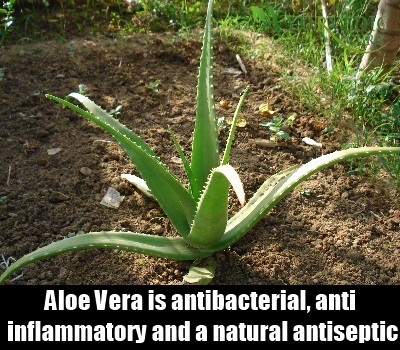 Aloe Vera gel can be taken from the leaves of this herb and applied on the abscess for quick relief. Aloe Vera gel extract can also be used for topical applications which will cure the abscess. Cold pressed Aloe Vera gel works best in such cases. Calendula is called Calendula Officinalis by botanists. In common parlance, this herb is referred to as Pot Marigold. 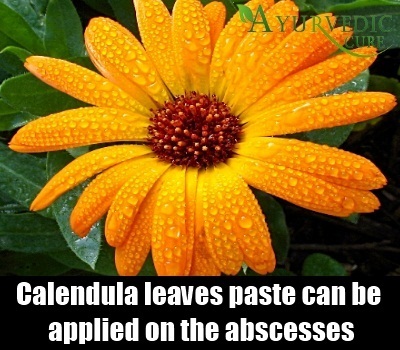 Calendula infused oil or Calendula leaves paste can be applied on the abscess for healing it. Calendula infused oil is prepared by placing leaves and flowers of this herb in a jar of Olive oil for some days in a sealed state. You can make a paste of Calendula leaves by crushing the leaves and mixing them with a little oil or water. Calendula is also antibacterial making it very efficacious for healing abscesses caused due to bacterial infections. Calendula is a known cure for skin conditions because of the ingredients that it possesses. This herb is part of many skin care products due to this reason. 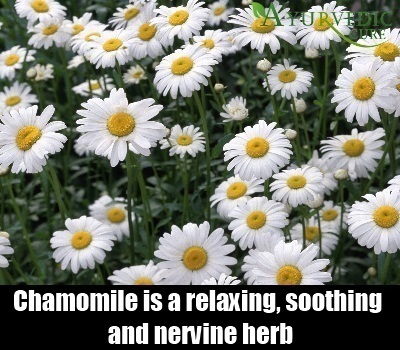 Chamomile is a relaxing, soothing and nervine herb which is also an adaptogen. This herb is a digestive tonic and a natural sedative. Among its other curative properties is that this herb is a potent anti-inflammatory which is known for its skin repairing abilities. Due to this, it is a potent herbal cure for abscesses. You can apply warm Chamomile oil directly on the abscess for curing the pain and easing the swelling. Chamomile also soothes the skin and makes skin healthy again. Due to its curative properties, this herb has been used in many skin and cosmetic preparations. Chamomile must not be opted for if you are pregnant or nursing. Also avoid this herbal remedy, if you are allergic to Rag Weed, Chrysanthemum, Asters or Daisies. Hydrastis Canadensis is the Latin name of this herb. Goldenseal is the ideal herbal remedy for abscesses. 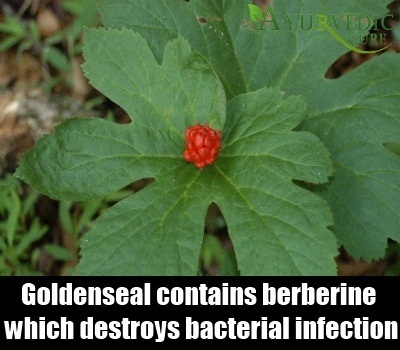 Goldenseal contains an active ingredient called berberine which destroys bacterial infection. As abscesses are caused by bacteria in many cases, Goldenseal is one of the most effective herbal remedies for this skin condition. Goldenseal tincture can be added to hot water and the solution applied on the abscess using a compress. You can also make a herbal poultice and apply it on the abscess for speedy recovery and quick healing. Tea Tree oil is extracted from the Tea Tree, which is a herbaceous tree well known for its medicinal properties. Botanically, this herb is known as Melaleuca Alternifolia. 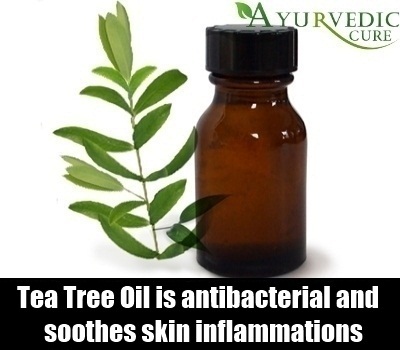 Tea Tree oil is antibacterial and it also soothes skin inflammations. Due to both these properties, it is an amazing herbal remedy for abscesses. You can mix Tea Tree oil with some warm water and apply this solution onto the abscess thrice a day for fending off the problem. Tea Tree oil is also a potent antiseptic because of which it is very effective in easing the pus out of the abscess and curing the abscess in a short period of time. Echinacea Augustifolia is the botanical name of this herb. It is also a good herbal cure for abscesses. Echinacea is commonly referred to as Purple Cone Flower due to the nature and shape of its blooms. 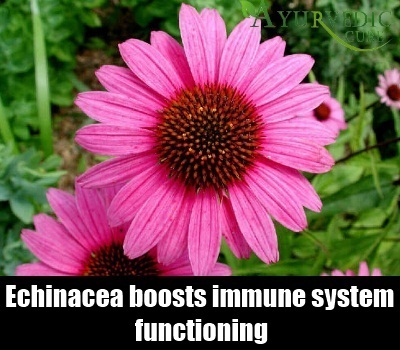 Echinacea is a potent immunostimulant herb which boosts immune system functioning. This herb also possesses strong antibacterial properties. Consequently, this herbal remedy can make a difference to the time taken for an abscess to heal. You can take Echinacea root tea for good results. Echinacea tablets or extract can also be taken for good results. Echinacea destroys the bacterial infection causing the abscess and improves the immunity of the body which prevents the recurrence of the abscess. Trifolium Pratense is the Latin name of this herb. Red Clover is the common term used to refer to this herb. This herb is antimicrobial and antibacterial. Due to the curative powers that it possesses, this herbal remedy is excellent for healing abscesses. 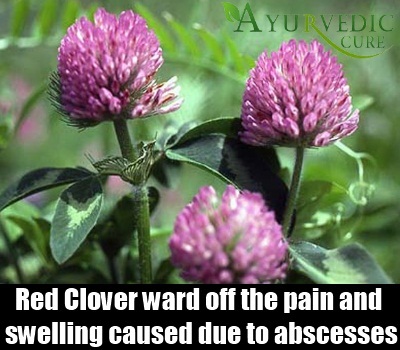 Red Clover contains isoflavones which heal the skin and help to ward off the pain and swelling caused due to abscesses. As this herb is also antibacterial, it is very useful for destroying the harmful bacteria that are causing the infection induced abscess to appear. You can drink Red Clover tea to cleanse your body and eliminate the bacteria causing the abscess.